Imagine a mobile computing device with which you could do whatever you wanted. Imagine that virtually every aspect of the phone was customisable to your every whim. Change the wallpapers. Install whichever applications you wanted, no jailbreaking needed. Heck, go ahead and change the operating system if you want to. Not quite as far fetched a scenario as one might imagine. 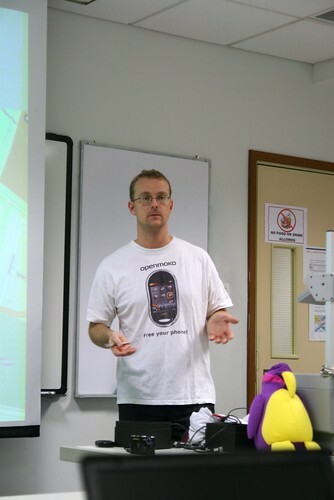 As Ole Tange, wiki master on wiki.openmoko.com, showed linuxNUS, the OpenMoko phones are exactly that customisable. Developed by OEM First International Computer (FIC), the OpenMoko project is "dedicated to delivering mobile phones with an open source software stack ". In fact, the promise of a completely open source software stack was precisely the thing that drove Ole to get involved with the OpenMoko projects. To him, the project was a breathe of fresh air in a world filled with the smog of software patents . In the first half of the session, Ole spoke about the various features of the OpenMoko platform, ranging from its hardware capabilities to the various types of applications that have been developed so far. There was also some discussion on the potential uses of a device such as the Neo FreeRunner. A notable mention is the idea of a location-based calendar. Have something to get done at the local supermarket? Tell your OpenMoko phone (the Neo FreeRunner, to be exact), and thanks to its built in GPS receiver, it’ll alert you when you’re in the vicinity. Alternatively, if you find that you have a tendency to leave home without your mobile device in the mornings, another interesting application idea put forward at the session was one that could get your phone to alert you if it was not already on the move in your pocket by the time your morning routine usually takes you out of the house. In the later half of the evening, Ole took the members of the audience on a tour of the internals of the Neo FreeRunner, cracking it open and laying bare its insides for all to see. One aspect of the device that was quibble-worthy though, was the large amount of empty space within its casing. The screen and circuit board assembly really isn’t all that huge, so it really makes one wonder why the device as-sold, is so chunky. 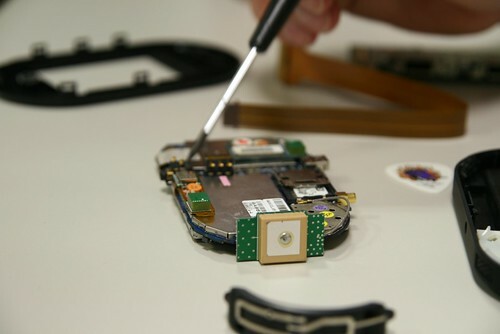 Apart from that though, it was really great to see a mobile device whose manufacturers readily claim that they actually want their users to take the things apart and play with them. There also had been word recently that OpenMoko had stopped development work on the FreeRunner’s successor . Do note though, that is only the development work on the subsequent device that has ceased, and that the OpenMoko project is still very much alive. CEO Sean Moss-Pultz also mentioned that the company’s efforts would now be channeled into what has been called "Plan B". What "Plan B" will be however, remains to be seen at this point. Looking forward, while its unfortunate that we won’t be seeing the next version of the OpenMoko Neo FreeRunner, it’s heartening to know that at least the ideals will still live on. The OpenMoko Linux distribution will still be developed, and perhaps, we’ll see its reemergence on a different device some time in the future.